Originating from Japan or the Americas, the hydrangea is a beautiful and hardy shrub and a tried-and-true favourite in Australian gardens. 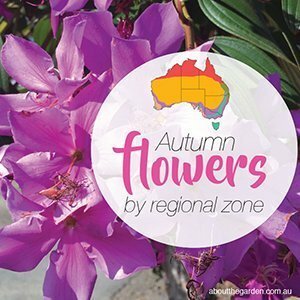 Its lush appearance and long-lasting, showy blooms can bring a touch of the tropics to even the coldest of climates and its ability to flower in damp, shady areas makes it one of our most sought-after garden plants. 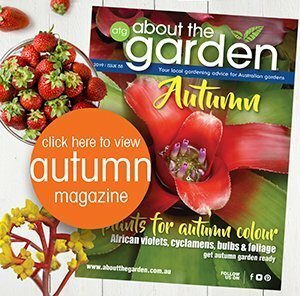 A revolution for gardeners and home decorators, bringing garden beauty into the home. Flowering continuously for up to 150 days with a magical colour transformation from pastel pink or blue, through to deep burgundy, this is a compact plant that really performs – indoors and in the garden. A living bunch of flowers, perfect on the kitchen bench and will outlast any cut flowers by months and months. Equally happy outside, Hydrangea ‘Magical Revolution’ has improved resistance to sun, frost, rain and all the elements. Plant in an acid-loving planting mix – Searles Azalea, Camellia & Gardenia Specialty Mix. 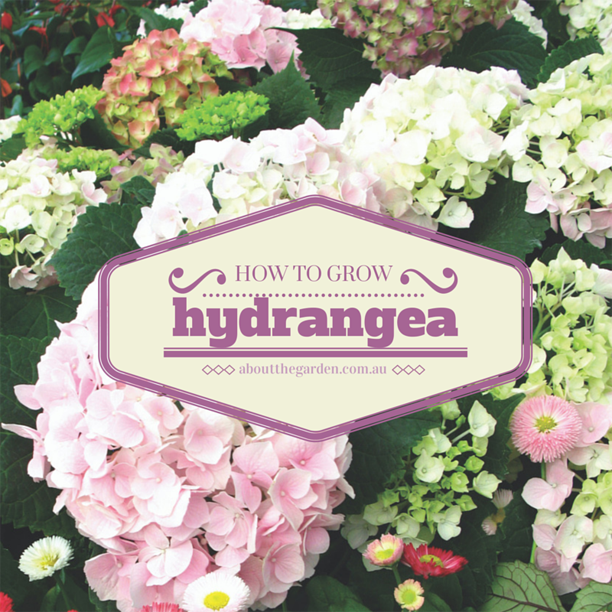 The soil you have in your garden is of particular significance because with most varieties of hydrangea, the soil pH will dictate flower colour. In acidic soils around pH 4.5–5.0, the flowers will be bright blue. In soils above pH 7, the flowers will turn mauve, pink or quite a strong, magenta-red. Adding Searles Garden Lime to the soil can make the flowers pinker. (Hydrangeas actually prefer a slightly acidic soil, so be mindful not to overuse lime on your soil. Learn how to use a Soil pH Test Kit) White flowering hydrangeas will stay white, whatever the soil pH. If you want to change the flower colour, it’s important to treat the soil before the flower buds form. For best results, a bluing tonic should be applied once a month in August, September and October and again in March and April. 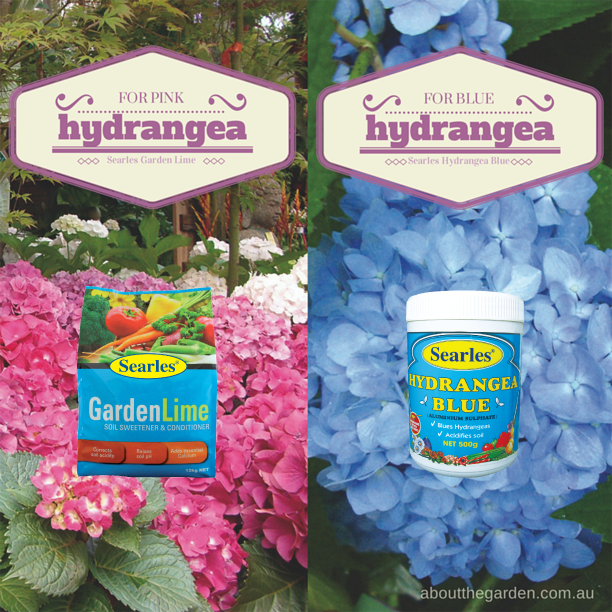 A cup of lime sprinkled around the root zone in spring will turn hydrangeas pink or red. Apply them to your hydrangeas every year and watch their flowers turn stronger and stronger shades of blue or pink with every flowering season. Note: Some modern varieties of hydrangeas available in gardening outlets don’t change colour according to the acidity of the soil. Please check with your local gardening outlet what type of hydrangea you are buying. Most hydrangeas will grow best in dappled or part shade. (They will let you know if they are getting too much sun — with browning leaves.) The southern side of the house is often the best place to plant hydrangeas. There are new varieties that can tolerate full sun but they will need more water in these conditions. Hydrangeas growing in the ground should be given a bucket of water once a week through the spring and summer. Potted hydrangeas should be watered every day from the end of spring and through summer. Place a saucer of water under the pot or even place the pot inside a bucket which is temporarily allowed to become partially filled with water to help keep the plant moist. Hydrangeas will quickly let you know when they need water as their leaves will wilt. However, they recover quickly when given water. 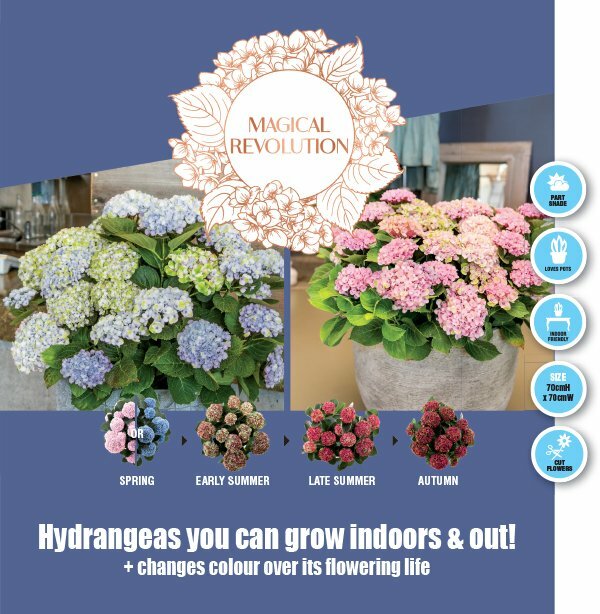 Try the new ‘Magical Revolution’ Hydrangea range for potted colour indoors and outdoors. Hydrangeas will benefit from a dose of SeaMax Fish & Kelp liquid plant food every two weeks throughout the growing season. 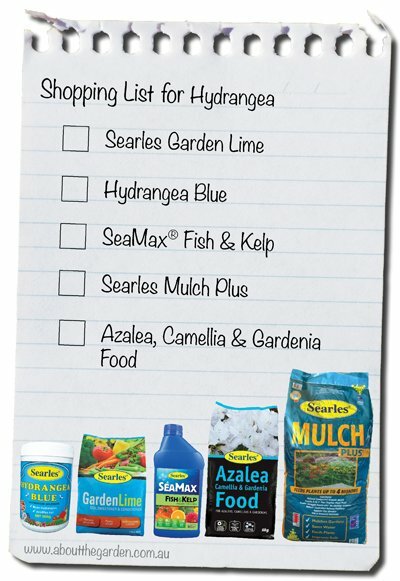 Alternatively, apply Searles Azalea, Camellia & Gardenia Food in early spring. Hydrangeas have shallow, fibrous roots, so maintain a layer of Searles Premium Garden Mulch around them. Hydrangeas become available in garden centres in late spring when they start to flower. 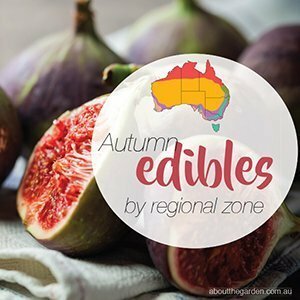 This is when you can choose from a range of varieties and all the latest cultivars. 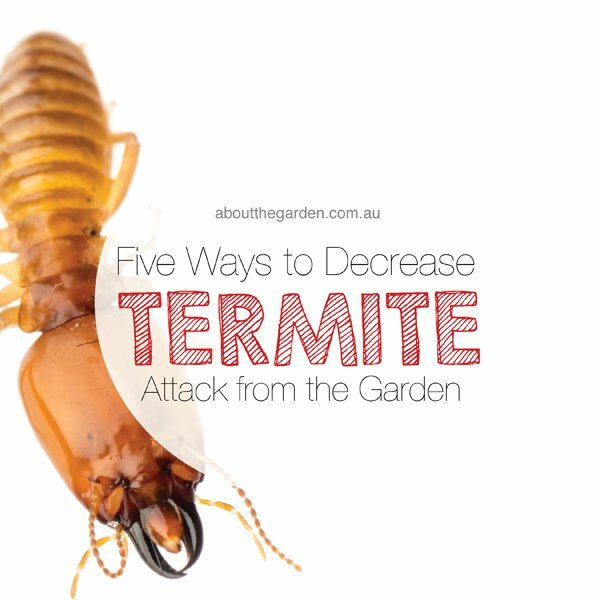 They also strike very easily from soft tip or hardwood cuttings, so if you see a nice one growing in your neighbour’s garden, why not ask for a cutting? Place the cutting in a pot of Searles Seed Raising Specialty Mix, water it and keep it enclosed in a sealed plastic bag until roots develop. Hydrangeas are resilient in almost any climate including windy, coastal conditions and regions with quite severe frosts. The deciduous varieties benefit from a pruning after they finish flowering. Prune off all the green, current season’s growth down to two plump eyes or leaf buds, but don’t prune too severely or it can limit the following season’s flowering. Don’t injure any new, green shoots and leave the stems that have yet to flower as they will provide next years’ blooms. Hydrangeas make excellent cut flowers and can last more than two weeks in a vase of water. They also make beautiful dried flowers. 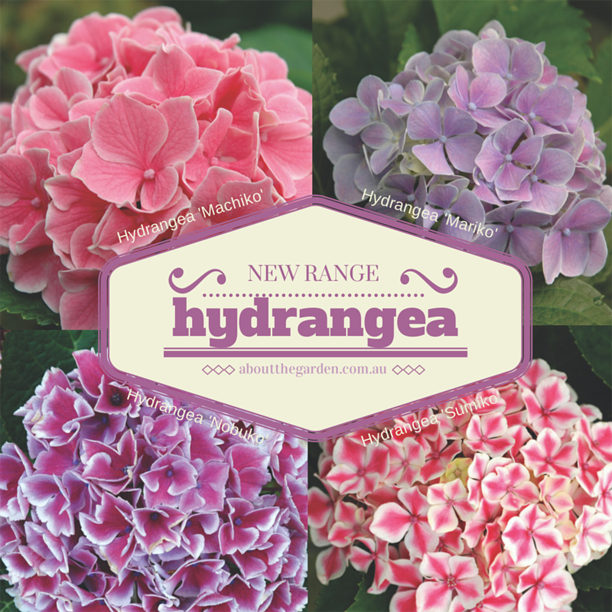 New wave hydrangeas offer an exciting new range of flower forms but are also hardier, more compact or flower more profusely than their parents.